Here’s some tables I’ve done to look at underlying stats recent form. People have different views as to what form constitutes. 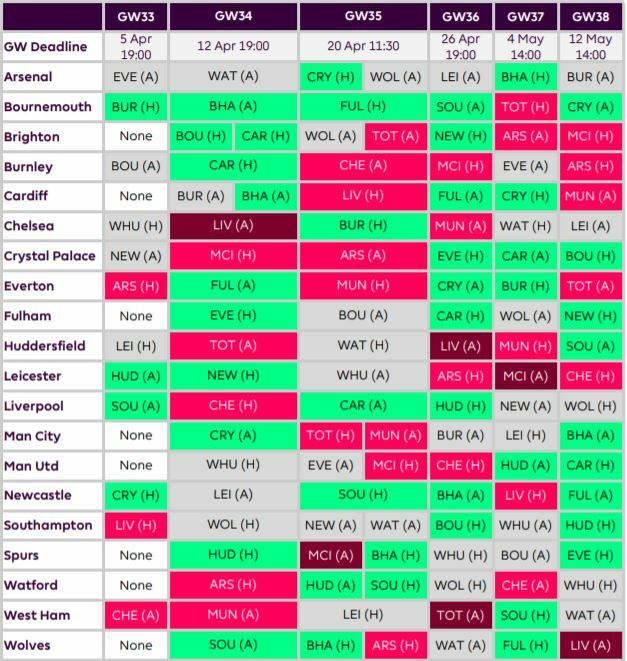 I think 4-6 games is way too short by itself and distorted by fixtures and one off performances so I’ve gone for the last 10 gameweeks with 5 gameweeks as a very recent form check. I’ve taken all the information from the amazing free site understat.com. I’ve taken the last 5 and 10 gameweeks expected goals per 90 minutes (xG90) and expected assists per 90 (xA90) and turned them into projected FPL points over a hypothetical season. I’ve then adjusted it for the average minutes played per appearance. I’ve also added a value for money column for Mids and Fwds where I’ve just taken the projected points and divided them by the players value. For attackers there’s no appearance clean sheet or bonus points. Just raw attacking points. For defenders the same. Just because a player is in the schedule doesn’t mean he is fit or a guaranteed selection. 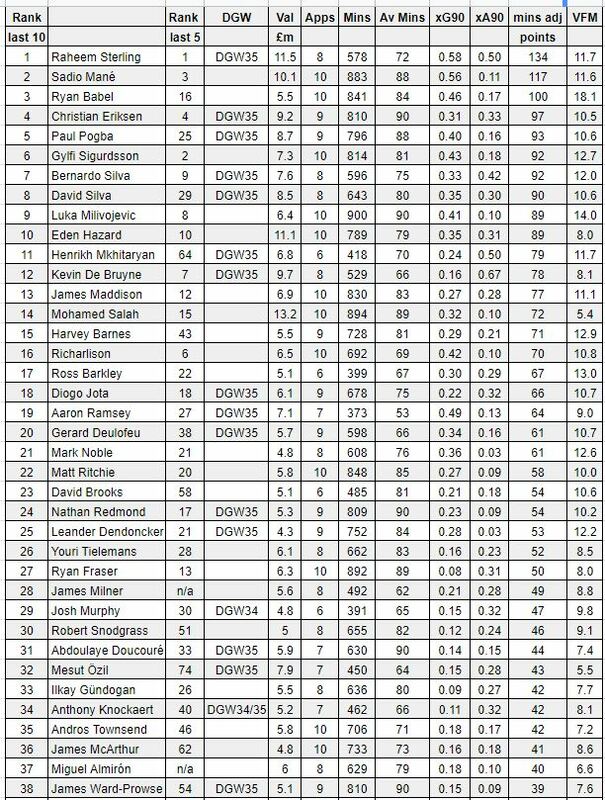 The table is sorted by projected goal and assist only season FPL points adjusted for average minutes over the last 10 gameweeks. No adjustment for clean sheet, bonus or appearance points. A notable absence is Son who’s 41st and 64th in the rankings. The table is sorted by projected goal and assist only season FPL points adjusted for average minutes over the last 10 gameweeks. No adjustment for bonus or appearance points. 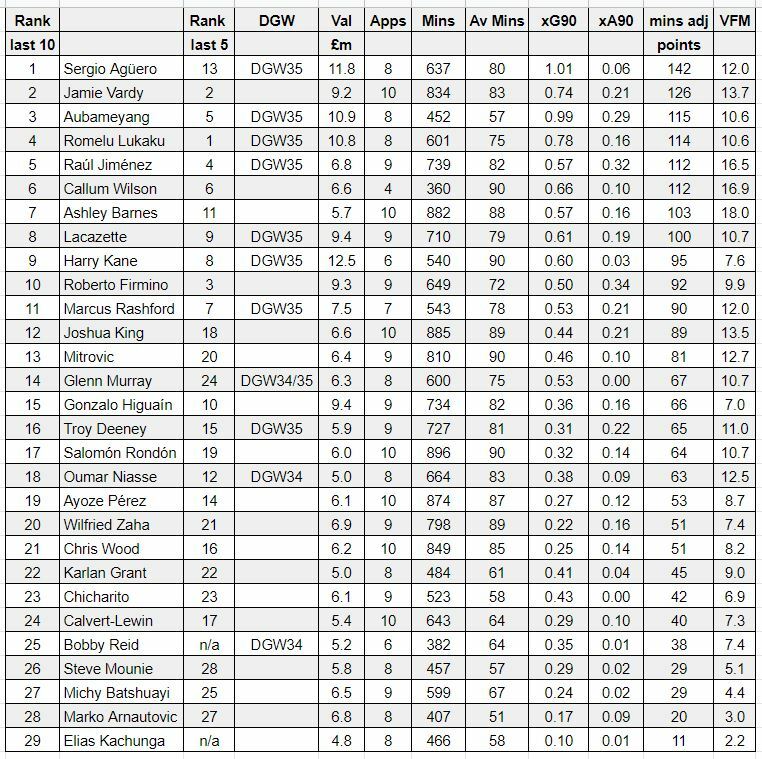 The table is sorted by attacking points only for projected season goal and assist FPL points adjusted for average minutes over the last 10 gameweeks. No adjustment for clean sheets, bonus or appearance points. The table is sorted by xG against over the last 10 gameweeks. The table is sorted by xG over the last 10 gameweeks. 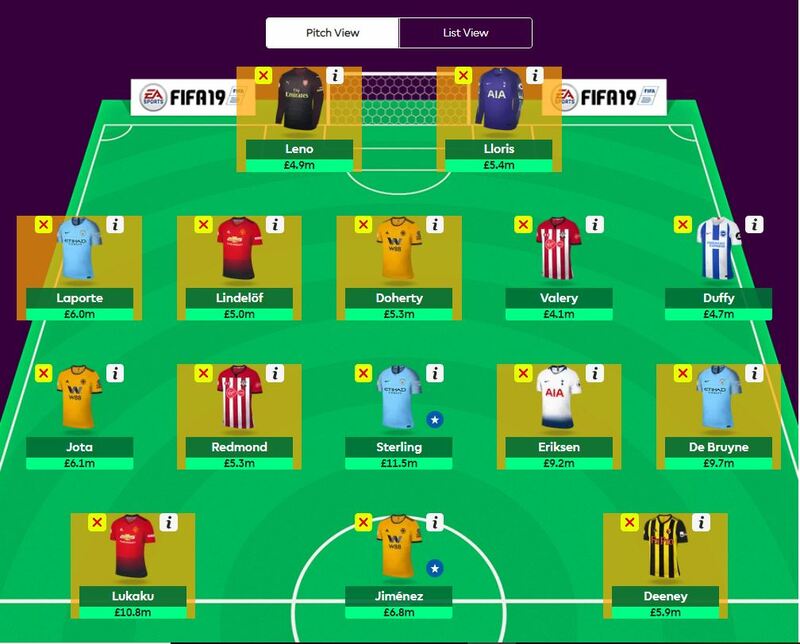 The team has been picked purely from those players with 2 fixtures in GW34 and or GW35. These are Man Utd, Brighton, Spurs, Wolves, Watford, Man City, Southampton, Arsenal and Cardiff. For defence I’ve taken the highest ranked teams and then picked the most attacking player. 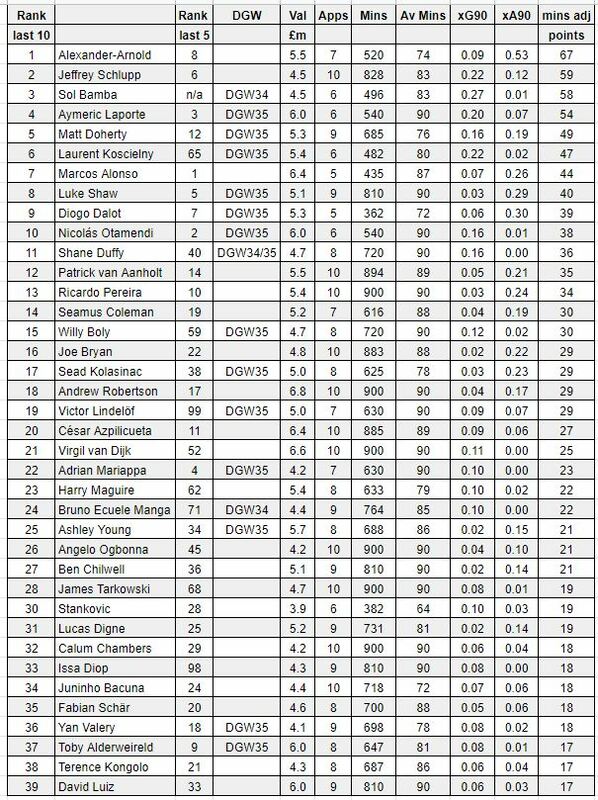 For midfield and forward I’ve picked only players who averaged more than 70 minutes per game (apart from 1 that I’ll explain). Also who haven’t seen a significant drop off in form from last 10 games to last 5 games and have a value for money factor of 10 or better although I have tried to spend all the cash. De Bruyne didn’t meet the criteria but was added on the basis that I thought he would average more nminutes given he was coming back from injury for the previous games. Aguero didn’t make it as he saw a drop off in stats. Kane as he didn’t make the 10 VFM ratio. It seems possible he’s injured now 2. No allowance has been made for the difficulty of fixtures. I’ve tried to maximise points of all players as if I was bench boosting. The team value is around £101m. It’s obviously too inflexible way of picking a team but hopefully you find it useful in considering your transfers.